Join us as we Introduce our new premium event platform: InterNations Soirée. For these special events we spend a little more time on the details, offering creative themes and more entertainment to the guest. In other words, you will certainly enjoy yourself. 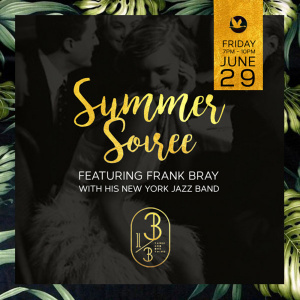 For this June 29th “Summer Soirée” launch event we’ve contracted a stunning jazz band featuring New York’s own Frank Bray singing Sinatra melodies throughout the evening. There will be a professional photographer and backdrop at this exquisite Bund 3 venue. Complimentary canapés and a cocktail will also be provided to guest from 7pm to 10pm. Club 3 1/3 is one of Shanghai’s best new clubs showing off an elegant atmosphere and high-end design. The sound system is top of the line and so are the cocktails. Dress code for the evening is Summer Chic. Please don’t wear sandals, you will not be given entrance. We look forward to see you for a fabulous evening!